In this groundbreaking debut, Justin Torres plunges us into the chaotic heart of one family, the intense bonds of three brothers, and the mythic effects of this fierce love on the people we must become. Three brothers tear their way through childhood--smashing tomatoes all over each other, building kites from trash, hiding out when their parents do battle, tiptoeing around the house as their mother sleeps off her graveyard shift. Paps and Ma are from Brooklyn--he's Puerto Rican, she's white--and their love is a serious, dangerous thing that makes and unmakes a family many times. Written in magical language with unforgettable images, We the Animals is a stunning exploration of the viscerally charged landscape of growing up, how deeply we are formed by our earliest bonds, and how we are ultimately propelled at escape velocity toward our futures. JUSTIN TORRES is a graduate of the Iowa Writers Workshop and a Wallace Stegner Fellow at Stanford. Among many other things, he has worked as a farmhand, a dog walker, a creative writing teacher, and a bookseller. "We the Animals is a dark jewel of a book. It's heartbreaking. It's beautiful. It resembles no other book I've read. We should all be grateful for Justin Torres, a brilliant, ferocious new voice." --Michael Cunningham "The best book you'll read this fall...We the Animals, a slim novel--just 144 pages--about three brothers, half white, half Puerto Rican, scrambling their way through a dysfunctional childhood, is the kind of book that makes a career....Torres's sentences are gymnastic, leaping and twirling, but never fancy for the sake of fancy, always justified by the ferocity and heartbreak and hunger and slap-happy euphoria of these three boys. It's a coming-of-age novel set in upstate New York that rumbles with lyric dynamite. It's a knock to the head that will leave your mouth agape. Torres is a savage new talent." --Esquire "First-time novelist Justin Torres unleashes We the Animals (Houghton Mifflin Harcourt), a gorgeous, howling coming-of-age novel that will devour your heart." --Vanity Fair "A novel so honest, poetic, and tough that it makes you reexamine what it means to love and to hurt. Written in the voice of the youngest of three boys, this partly autobiographical tale evokes the cacophony of a messy childhood--flying trash-bag kites, ransacking vegetable gardens, and smashing tomatoes until pulp runs down the kitchen walls. But despite the din the brothers create, the novel belongs to their mother, who alternates between gruff and matter-of-fact--'loving big boys is different from loving little boys--you've got to meet tough with tough.' In stark prose, Torres shows us how one family grapples with a dangerous and chaotic love for each other, as well as what it means to become a man." --O, the Oprah Magazine "The imagistic power of Justin Torres' debut, We the Animals (Houghton Mifflin Harcourt), exists in inverse proportion to its slim 128 pages. Just try shaking off this novel about three upstate New York brothers whose knockabout childhoods with their Puerto Rican 'Paps' and white 'Ma' are the narrative equivalent of feral kitties being swung overhead in a burlap bag." --Elle Magazine "A kind of heart-stopping surge of emotion and language in this musical tornado of a novel." --Pam Houston in More Magazine "[We the Animals] packs an outsized wallop; it's the skinny kid who surprises you with his intense, frenzied strength and sheer nerve. You pick up the book expecting it to occupy a couple hours of your time and find that its images and tactile prose linger with you days after...what stays with me are the terrible beauty and life force in Torres' primal tale." --Newsday "A slim book can hold volumes. 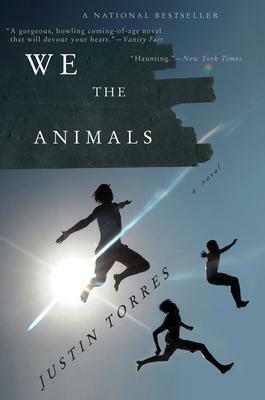 We the Animals, the first novel from Justin Torres, is such a book. Not an ounce of fat on its slight frame, but the story is sinewy. Stong....We the Animals crafts beauty out of despair. From lives so fragmented they threaten to break off into oblivion at any moment, Torres builds a story that is burnished, complete. That takes talent, diligence and more than a little grace." --Houston Chronicle "We the Animals is a book so meant to break your heart that it should lose its power just on the grounds of being obvious. That it pierces--with an arrow dipped in ache--signals that Justin Torres is a writer to embrace from the start. This is his first novel." --Newark Star Ledger "Some books quicken your pulse. Some slow it. Some burn you inside and send you tearing off to find the author to see who made this thing that can so burn you and quicken you and slow you all at the same time. A miracle in concentrated pages, you are going to read it again and again, and know exactly what I mean." --Dorothy Allison "In language brilliant, poised and pure, We the Animals tells about family love as it is felt when it is frustrated or betrayed or made to stand in the place of too many other needed things, about how precious it becomes in these extremes, about the terrible sense of loss when it fails under duress, and the joy and dread of realizing that there really is no end to it." --Marilynne Robinson "We the Animals snatches the reader by the scruff of the heart, tight as teeth, and shakes back and forth--between the human and the animal, the housed and the feral, love and violence, mercy and wrath--and leaves him in the wilderness, ravished by its beauty. It is an indelible and essential work of art." --Paul Harding, Pulitzer Prize-winning author of Tinkers "We the Animals marks the debut of an astonishing new voice in American Literature. In an intense coming-of-age story that brings to mind the early work of Jeffrey Eugenides and Sandra Cisneros, Torres's concentrated prose goes down hot like strong liquor. His beautifully flawed characters worked their way into my heart on the very first page and have been there ever since." --Tayari Jones, author of Silver Sparrow "We the Animals is a gorgeous, deeply humane book. Every page sings, and every scene startles. I think we'll all be reading Justin Torres for years to come." --Daniel Alarcon, author of Lost City Radio and War by Candlelight "Three brothers and a dueling husband and wife are bound by poverty and love in this debut novel from Stegner Fellow Torres...The short tales that make up this novel are intriguing and beautifully written"
--Publishers Weekly "An exquisitely crafted debut novel--subtle, shimmering and emotionally devastating...the narrative voice is a marvel of control--one that reflects the perceptions and limitations of a 7-year-old in language that suggests someone older is channeling his younger perspective. In short chapters that stand alone yet ultimately achieve momentum, the narrator comes to terms with his brothers, his family and his sexuality, separating the 'I' from the 'we' and suffering the consequences. Ultimately, the novel has a redemptive resonance--for the narrator, for the rest of the fictional family and for the reader as well. Upon finishing, readers might be tempted to start again, not wanting to let it go." JUSTIN TORRES is a graduate of the Iowa Writers' Workshop, a recipient of a Rol n Fellowship in Literature from United States Artists, and a Wallace Stegner Fellow at Stanford.